Do you have questions regarding your child's development? A brief, informal check of general speech-language or fine motor milestones to determine if your child's skills are likely age-appropriate. This may help determine if a comprehensive evaluation is needed. If your child currently receives speech and language or occupational therapy services and/or a medical professional has recommended an evaluation, this step is often not needed. If you have concerns regarding your child's skill development, this is often a good starting point. The speech-language and/or fine motor screening occurs at our center-based program, often lasting around 30 minutes. It includes a brief observation of your child and a short parent interview. At the end of the 30 minute session, Bringing Therapy Home can better determine if your child's speech-language or fine motor skills fall within a typical range or if an evaluation is recommended. A comprehensive, team-based evaluation with a speech-language pathologist and occupational therapist conduct an evaluation using a combination of standardized testing, informal assessments, a review of your child's records (e.g. your child's IEP, etc. ), observations, and a parent interview to identify your child's strengths and areas of need. The initial assessment is often conducted in 1-2 sessions with each session lasting 45-60 minutes. A written report will be provided with an individualized treatment plan and recommendations. 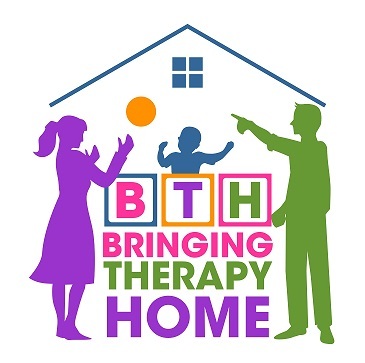 Therapy services are offered at our center using a play-based, highly interactive, child-directed approach. Session length and frequency will be based on your child's individual needs, although most children receive therapy once a week for 45 minutes. Parents are highly encouraged to be present during the session to better understand how to embed skills into the child's natural environment. Parents are provided with a written progress report on identified goals and objectives following 12 therapy sessions.